Download the images and worksheet associated with this post. I like to give my students different ways to practice chromosome counting. Below is a micrograph taken by a former undergraduate student in my lab, Maya Benavides. To take this picture, Zea mays (corn) seeds were germinated and the root tips were removed. 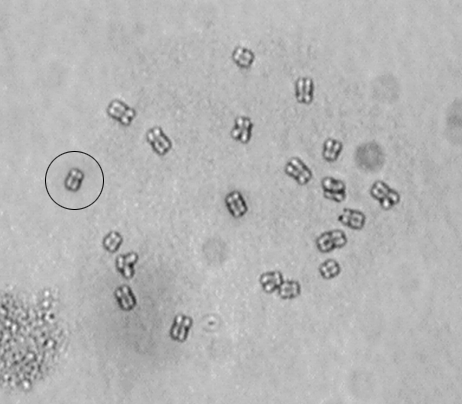 The root tip is where most of the mitosis is occurring in the root and, since we wanted to capture condensed chromosomes, using a tissue with many mitotic cells was important. After digesting the cell walls and squashing the tissue on a slide it was possible to find nice chromosome spreads like the one shown below. 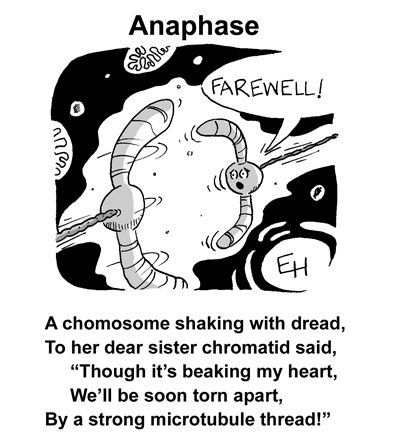 1) How many pairs of sister chromatids are shown in the picture? 2) A diploid corn cell has _____ total chromosomes. Answer...20. Each of the pairs of sisters is a single chromosome despite the fact that each pair of sisters is actually composed of two double-stranded DNA molecules (see my previous post on chromosomes and chromatids). There were 20 chromosomes in this cell before DNA replication and there are 20 chromosomes in the cell now (at the start of mitosis). DNA replication doesn't change chromosome number. 3) A diploid corn cell has _____ homologous pairs of chromosomes. Answer...10 Corn is diploid meaning that it has homologous chromosomes. For each chromosome in the picture there is another chromosome with similar length, centromere position, and gene content. (An expert could look at this picture and match all the homologs up.) These homologs are not be identical...they have the same genes in the same order, but, they can have different alleles of those genes. 4) If a Z. mays cell were to undergo meiosis, _____ bivalents would be visible in metaphase of meiosis I. Answer...10. In meiosis I homologous chromosomes pair up to form a bivalent (also known as a 'tetrad', see picture below). Since there are 20 total chromosomes, 10 bivalents form when the homologs come together. "Bivalent" by internet - http://110.138.206.53/bahan-ajar/modul_online/biologi/meiosis/glossary/glossary_frameset.htm. Licensed under CC BY-SA 2.5 via Wikimedia Commons. 5) A Z. mays gamete will have _____ total chromosomes. Thanks for checking this out. Please submit questions or suggestions in the comment area below. Wonderful post! Your work always has something that contains a good amount of information and I am very much amazed by your work too. Keep it up!